The objective of the present document is to regulate the USAGE RULES and PROTECT USERS of massalagros.com (herein, MAS SALAGROS), property of SALAGROS 1497 S.L, with domicile Riera de Vallromanes s/n Can Sala Gros, 08188 Vallromanes (Barcelona). The terms “You” and “User” are used here to refer to all individuals and/or entities that access this Web site for any reason. SALAGROS 1497 S.L wants to bring the SALAGROS 1497 S.L world to its users through massalagros.com. To do this, SALAGROS 1497 S.L makes information and services related to the hotel available through massalagros.com like online room reservations, advance reservations of meeting rooms, online restaurant reservations, image banks and Customer Service. The usage of this page and/or its services supposes the full acceptance without reservations and the validity of each and every one of the General Conditions contained in the last updated version of these Usage Rules. For this reason, users should be aware of the importance of reading them each time they visit massalagros.com. Access and/or use of specific services offered to users (herein referred to as the “user”) on ¡’¡’, may be subject to certain conditions that, depending on the case, will replace, modify and/or complete these Usage Rules, due to which the user, prior to accessing and/or using these services and contents, must read and accept these conditions. 2.1 The user is obliged to use the massalagros.com page and those services placed at his disposal on the same in a way that is legal, moral, follows good customs and public order, as well as in accordance with the present Usage Rules. Consequently, the user cannot use the massalagros.com page or services for illicit purposes or objectives that go against what is established in the present Usage Rules or that are damaging to the rights and/or interests of third parties or that could damage the massalagros.com page in any way or prevent its normal use or the use of the services accessible through the same by the rest of the users, SALAGROS 1497 S.L and/or its image. 2.2 SALAGROS 1497 S.L may be able to, for greater operating speed of the www.massalagros.com page and in benefit of its users, unilaterally modify at any time and without giving prior notice the services provided or any substantial aspect of the present page or the operating conditions, usage techniques and use of the services of massalagros.com. Similarly, users, with the goal of improving the service and establishing the optimal quality level, the end goal of SALAGROS 1497 S.L, shall be able to suggest modifications that they consider useful by contacting the Web site managers at the e-mail address recepcion@massalagros.com. 2.3 Users of massalagros.com shall have to observe any instruction that is duly authorised and imparted through e-mail, massalagros.com or SALAGROS 1497 S.L or its personnel. Users of massalagros.com, when sending their CVs in response to jobs that are offered through www.massalagros.com, are voluntarily providing personal data (herein referred to as Personal Data) that SALAGROS 1497 S.L will handle and add to an automated file with the objective of being able to provide and offer its services. This file is the responsibility of SALAGROS 1497 S.L, and will be registered with the competent authority. The owners of the data have the right at all times to access the file and can exercise their rights of rectification, cancellation and opposition under the terms contained in data protection legislation. Similarly, user consent for the handling and transfer of their personal data will be revocable at all times without retroactive effects, pursuant to what is established in articles 6 and 11 of Organic Law 15/1999, dated 13 December concerning Personal Data Protection. 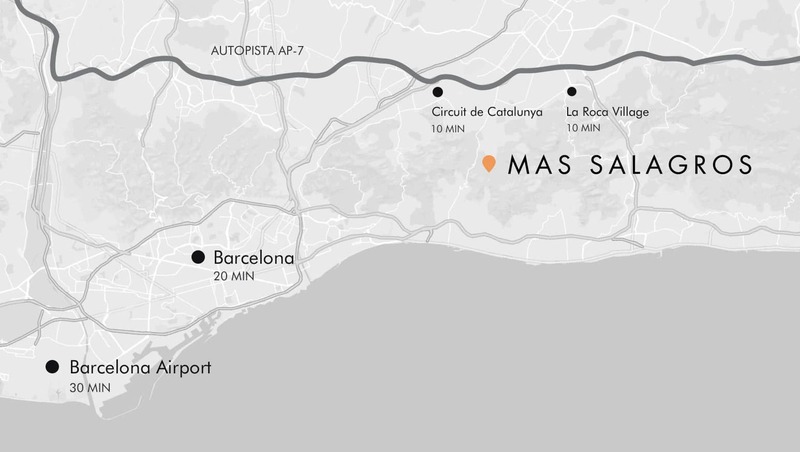 For these purposes, simply contact SALAGROS 1497 S.L at the e-mail address recepcion@massalagros.com, or writing to its corporate residency at Riera de Vallromanes s/n Can Sala Gros, 08188 Vallromanes (Barcelona), Spain. SALAGROS 1497 S.L guarantees that it has adopted the appropriate security measures for its facilities, systems and files. Likewise, SALAGROS 1497 S.L guarantees the confidentiality of Personal Data, although this Personal Data shall be revealed to public competent authorities, as well as any other information in its power or accessible through its systems or that is required in accordance with legal and regulatory regulations that are applicable in this regard. Users of www.massalagros.com guarantee and vouch in all cases for the veracity, exactitude, validity and authenticity of the Personal Data provided and are obliged to keep them duly updated. SALAGROS 1497 S.L services are not directed towards minors and SALAGROS 1497 S.L does not request or collect information related to minors. Furthermore, SALAGROS 1497 S.L can collect information through devices such as cookies or file logs about user navigation on massalagros.com. These devices are associated exclusively with a single user and their own personal computer. In this case, SALAGROS 1497 S.L shall only use these data as a whole with the end goal of improving its services. It is possible that SALAGROS 1497 S.L will share this information with its client companies, but in the same way and as a whole for statistical purposes only. SALAGROS 1497 S.L reserves the right to exclude, temporarily or definitively, users in any of the following cases. For non-compliance with any of the General Usage Conditions established in the present document. For non-compliance with the law, morality and public order. User exclusion shall not involve the renouncement of SALAGROS 1497 S.L to be able to carry out the corresponding legal actions or the indemnities that correspond by law. SALAGROS 1497 S.L reserves the right to unilaterally modify without advance notice any of the terms and conditions of the present Usage Rules under the terms and conditions its deems appropriate, notifying its users about the modifications made through massalagros.com. Users must use the contents and information contained on www.massalagros com diligently, correctly and lawfully and concretely, only for personal use and not commercially, provided that the content or any mention of sources, copyright and other identifying data concerning rights is not eliminated or modified about SALAGROS 1497 S.L or about third parties, in other words, the original form must be respected. Any reproduction or copying, distribution or publication of any type of the content of the information published on www.massalagros.com without the prior, written authorization of SALAGROS 1497 S.L is prohibited. Authorization for reproduction can be requested at the e-mail address recepcion@massalagros.com. If any user or third party thinks that any of the content on www.massalagros.com has been entered in violation of author rights or other rights for the protection of intellectual property, please communicate this circumstance to SALAGROS 1497 S.L by sending an e-mail to recepcion@massalagros.com, which minimally includes the following information: a) Name, address, telephone number and e-mail address of the claimant. b) Data about the owner of the author rights or other rights concerning the protection of intellectual property that may have been violated. c) Indication about this content in violation and its location on the page of www.massalagros.com. d) Declaration that the content has been placed on the page without the express authorization of the owner of the author rights or other intellectual property rights. Without prejudice to that which is contained in the preceding paragraphs, SALAGROS 1497 S.L reserves the right to defend itself against claims based on current legislation about publicity and author rights and other rights protecting intellectual property. 7.1 If www.massalagros.com refers to third party links to advertising or Web pages, SALAGROS 1497 S.L is not obliged to control or not control previously, approve nor take on the services, contents, data, files, products and any class of material existing on third party Web page(s), due to which SALAGROS 1497 S.L shall not vouch in any circumstance for the legality of the content of the page(s), with this being the exclusive responsibility of the third party, for informational purposes and not limiting, the respect for legality, morality, good customs and public order of the contents, as well as the fact that these do not damage any third party rights. A hyperlink does not presuppose a relationship of any type between SALAGROS 1497 S.L and the owner of the Web page on which this link is established. 7.2 Users or third parties who try to establish a hyperlink with the www.massalagros.com page must guarantee that this hyperlink only allows access to the pages or services of the www.massalagros.com page, but does not carry out, for informational purposes and not limiting, content reproduction, deep-links, browsers, inexact or incorrect statements about the contents or the Web page of www.massalagros.com. Except for those symbols that are part of the hyperlink, users shall guarantee that the Web page on which the link is established does not contain brands, commercial names, establishment logos, names, logotypes, slogans or any type of distinctive sign belonging to SALAGROS 1497 S.L. 8.1 SALAGROS 1497 S.L DOES NOT GUARANTEE THE RELIABILITY, AVAILABILITY OR CONTINUITY OF THE OPERATION OF THE WEB PAGE OR ITS PRODUCTS OR SERVICES MADE AVAILABLE TO USERS, DUE TO WHICH IT IS EXCLUDED FROM ANY RESPONSIBILITY FOR DAMAGES OF ANY TYPE THAT COULD ARISE DUE TO THE LACK OF AVAILABILITY, RELIABILITY OR CONTINUITY OF ITS WEB PAGE OR ITS SERVICES, ALTHOUGH IT SHALL TRY TO PROVIDE TECHNICAL HELP TO THE AFFECTED PARTY TO THE BEST OF ITS ABILITIES. 8.2 SALAGROS 1497 S.L IS NOT OBLIGATED TO CONTROL OR NOT CONTROL IN ADVANCE, THE ABSENCE OF VIRUSES OR ELEMENTS IN THE CONTENT THAT COULD CAUSE ALTERATIONS TO THE SOFTWARE OR HARDWARE OF USERS OR PERSONS VISITING THE PAGES, DUE TO WHICH IT WILL NOT RESPOND FOR ANY DAMAGES OF ANY TYPE THAT COULD ARISE FOR THESE AFOREMENTIONED REASONS OR ANY OTHERS. 8.3 SALAGROS 1497 S.L IS NOT OBLIGATED TO CONTROL OR NOT CONTROL IN ADVANCE, APPROVE OR TAKE ON THE SERVICES, CONTENTS, DATA, FILES, PRODUCTS AND ANY TYPE OF MATERIAL ON THE WEB PAGE(S) OF THIRD PARTIES, DUE TO WHICH SALAGROS 1497 S.L SHALL NOT RESPOND IN ANY CIRCUMSTANCE TO THE LEGALITY OF ITS WEB PAGE(S), WITH THIS BEING THE EXCLUSIVE RESPONSIBILITY OF THE THIRD PARTIES, FOR INFORMATIONAL PURPOSES ONLY AND NOT LIMITING, CONCERNING THE RESPECT FOR LEGALITY, MORALITY, GOOD CUSTOMS AND PUBLIC ORDER OF THE CONTENTS AS WELL AS THAT THESE DO NOT DAMAGE THE RIGHTS OF ANY THIRD PARTIES. 8.4 SALAGROS 1497 S.L IS NOT OBLIGATED TO CONTROL OR NOT CONTROL OR TO GUARANTEE THE RELIABILITY, AVAILABILITY OR CONTINUITY OF THE OPERATION OF THE PRODUCTS OR SERVICES MADE AVAILABLE TO USERS THROUGH THIRD PARTIES LOCATED OUTSIDE OF www.massalagros.com. DUE TO THIS, IT IS EXCLUDED FROM ANY RESPONSIBILITY FOR DAMAGES OF ANY TYPE THAT COULD BE DUE TO THE LACK OF AVAILABILITY, RELIABILITY OR CONTINUITY OF ITS WEB PAGE OR ITS SERVICES. 8.5 USERS MUST ANSWER TO ANY DAMAGES OF ANY TYPE THAT SALAGROS 1497 S.L COULD SUFFER AS A CONSEQUENCE OF THE NON-COMPLIANCE BY THE USER WITH THE LAW OR ANY OF THE GENERAL CONDITIONS CONTAINED IN THE PRESENT AGREEMENT. If one of the stipulations of the present Usage Rules is declared null or non-operative, the rest of the conditions shall continue under the agreed upon terms. SALAGROS 1497 S.L is obligated to replace the stipulation affected by this nullity, making it as close as possible to the intention initially sought by the parties. These Usage Rules shall be governed by Spanish Law. SALAGROS 1497 S.L and users, for the resolution of any controversy that could arise with respect to its total or partial validity, execution, fulfilment or resolution, shall submit, with express renunciation of their own courts or any others that where applicable could correspond to them to the competence of the Courts and Tribunals of Barcelona the capital. This contract represents the complete and integral expression of the agreement between SALAGROS 1497 S.L and the user, and replaces any previous agreements, commitments, statements or pacts, both written and oral that previously existed between both parties.